Click the cover image below to read and download the Fall 2012 digital issue of the Nonprofit Quarterly. All the cool kids understand that real reciprocal engagement with constituents is the way you build adherents, and that adherents equate to power, influence, and sustaining cash. This requires that many of us refit ourselves in the old spirit of the civil sector—but with new tools. Nonprofits are in an unusually strategic position relative to the direction of the new economy. Are we prepared to take advantage of it? From lying to staff to conflicts of interest, unethical behavior in nonprofits abounds. Here the author outlines three particularly relevant markers of a responsible organization as well as four trends shaping future standards for nonprofits. This article describes how a group of service providers, funders, and policy makers used value network analysis to assess the adolescent health system in Austin, Texas, and mobilize for positive change. Nonprofits can feel like philanthropy’s “tiny dancers”—performing the latest and greatest ideas at philanthropy’s behest, whether or not the intervention fits the organization’s infrastructure and practice. But every so often a proposed “new” management practice leads to meaningful change. As the political environment grows ever more polarized, how are nonprofits that venture into the public-policy arena to avoid charges of partisanship? Loosening restrictions are creating an exciting environment for China’s emerging nonprofit sector, but the pathways to official recognition are still arduous and millions of organizations remain unregistered—and thus illegal. This fascinating article is a complex and dramatic snapshot of the organizations of civil society in today’s China. 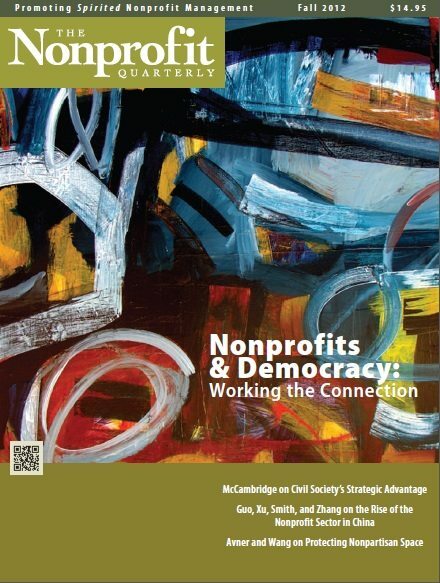 This edition of the Nonprofit Quarterly is about the connection between nonprofits and democracy. How do we reach the populations less likely to vote (lower-income; youth under thirty; Latino; recent immigrant populations)? The author asserts that, given their civic reach, nonprofits are a natural for closing these participation gaps. Is your organization up to the challenge?